The other day I found a carefully-addressed envelope with my name on it in the mail. When I opened it, there was a sweet note that a friend of mine from school had sent me, and it made my whole day! Snail mail is one of my favorite things, and I think it actually has some serious value that we often overlook. 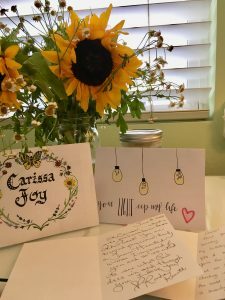 Snail mail can be an incredible tool in helping us to cultivate some of the qualities God has called us to live by. Nobody thinks of mailing a letter nowadays because, of course, that would take too long. We’re too caught up in the deadlines and due dates and hustle to tolerate the idea that something might take a day or two to deliver. If my text message doesn’t say “delivered” 10 seconds after I send it, I get annoyed with my phone. We’re so caught up in finding the newest and best and latest and greatest that we sometimes forget the value of taking our time and saying words with meaning. So here are a few of my thoughts on the values that snail mail helps to restore in this crazy busy world. Snail mail reminds us to think about the words we share. If you get a text that says, “How’re you?” what’s your response going to be? I’ll usually type back a quick, “Great, thanks! How’re you?” and then continue on with my day. But if I get a letter that asks how I’m doing, I’ll take a few moments to think about how my week has been and what God has been teaching me and what I’ve been doing. Let’s not get so comfortable with our typical responses that we forget to be honest. As we think about what people ask us and answer truthfully, we become people of honesty. We ask questions and answer questions sincerely. Snail mail reminds us to make an effort to reach out to people. In today’s culture, it’s easy to have lots of friends who live far away and are not involved in our daily lives. While this is fine and good, some friendships are worth cultivating. When I receive a letter from a friend, I know she put time, effort, and energy into writing something for me. It makes me feel loved and valued. Similarly, if I respond to a letter it takes my time, effort, and energy. This will take longer than liking a Facebook post, but it shows that we truly value whomever we are writing to. By taking the time to cultivate friendships, we are becoming people of intention. We invest in who we care about and are not too busy or afraid to show our friends we value them. Snail mail helps us to see, create, and appreciate beauty. One of my friends made me a gorgeous card and used calligraphy to write out my name. It made me feel so loved and appreciated as I enjoyed the beautiful letter she wrote! Every time I see it, I feel valued and it brings a smile to my face. God created so much beauty in this world; just look up at the sun peeking through the clouds, feel the wind brush against your face, or close your eyes and smell the nearest flower! However, sometimes we forget to create and appreciate beauty because we think it’s unnecessary. Making something beautiful isn’t going to help you get ahead by the world’s standards, but it might help you grow closer to the Beautiful One who made you. As we take the time to write a sweet note and decorate it with a simple drawing or write out our friend’s address in a fun font, we become people of beauty. We create beautiful things because the One who created us is beautiful. We reflect Christ. By taking the time to think about a friend, write them a letter, be honest, and make it beautiful, we have a tangible reminder to slow down and breathe. We not only connect better with our friend, but we connect better with God. Since he is honest, intentional, and beautiful, we reflect and glorify him when we exhibit those attributes. And I betcha that as we snag a moment to write down some thoughtful words, address an envelope in our best handwriting, or stick a stamp on our note, we’ll begin to notice God and his attention to detail more. We’ll see how he intentionally makes the world special and stunning each day. Not every day will be rainbows and bunnies, but we’ll see how he is present even in the rough times. So today, sit down, write a letter, and remember that it’s okay to take a deep breath. Hold onto the hope that God is with you, and be encouraged because Jesus created you with honesty, intention, and beauty.